If I were a high-powered executive, I might have an assistant following me around at all times with a notepad and a cell phone, managing my schedule and reminding me of deadlines and appointments. But I'm not, so I rely on my Mac and a new breed of online services to keep me on top of my calendar and tasks. You may already schedule meetings and to-do items with Leopard's iCal or an online service like the free Google Calendar ( ); both provide alarms you can use to notify yourself of impending events. But just because your schedule starts with a Mac doesn't mean you have to stay tethered to one. You can receive alerts via e-mail, SMS text messages, RSS feeds, phone calls, and more. I'll show you some of the interesting ways you can remind yourself of important tasks and events. What's the use of meticulously scheduling appointments and tasks if you don't stick to your schedule? Both iCal and Google Calendar provide multiple types of reminders that can reach you whether you're sitting in front of your Mac or hitting the road. See It on Screen The most common type of reminder is the standard on-screen pop-up alert. To set one up in iCal, double-click on the event, click on Edit, choose a reminder type from the Alarm pop-up menu (for instance, Message or Message With Sound), and specify when you want the alarm to appear. You can set up multiple types of reminders, or ones that go off at different times, by repeating this procedure. If you don't like the standard reminder window, customize it. Growl Team's free Growl works with dozens of programs to provide systemwide notifications. After installing the software, you launch System Preferences, select Growl, and choose a look for notices (anything from a tiny, unobtrusive transparent window in the corner of the screen to a huge alert with obnoxious graphics, your choice). You can also pick the position of your alerts and choose the amount of time they stay on screen, along with other options. 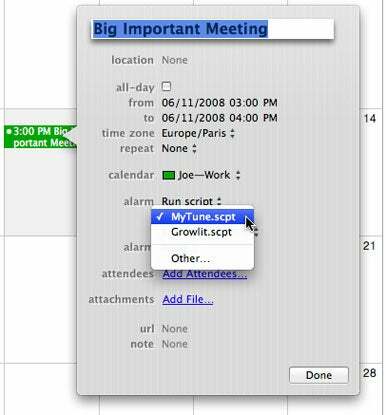 Though iCal doesn't support Growl, you can get around this by using imAGn's free GrowlIt AppleScript. Simply set iCal to run this AppleScript as the alert for any event, and Growl will display notifications the way you configured them. Google Calendar can display pop-up alerts, but only when you're logged in. Select an event and click on Edit Event Details. Under the Options section, you can customize and add alerts. To create a new one, click on the Add A Reminder link, choose Pop-up, set a time, and click on Save. 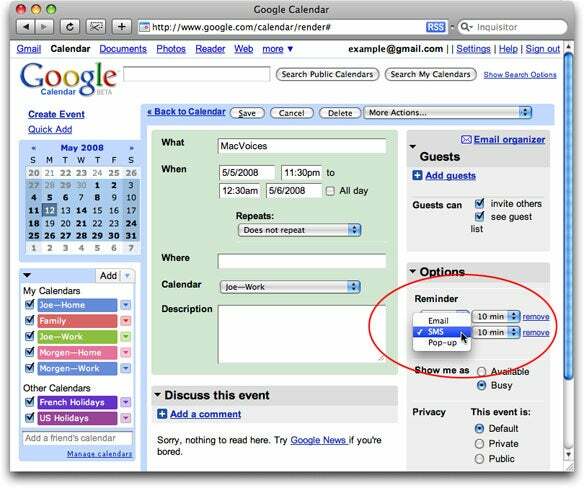 Choose a type of alert for any Google Calendar event. To use Growl with Google Calendar, install two free pieces of software (in addition to Growl itself): Google Notifier (which informs you of impending appointments and new Gmail messages) and Waffle Software's Google+Growl (in beta at press time). Once you configure both, you'll get Growl-based alerts for your Google Calendar events even when you're not logged in. To disable Notifier alerts and receive only Growl reminders, go to Notifier's Preferences (under its menu-bar item), select the Calendar tab, and deselect the Display Upcoming Event Reminder Pop-Up option. Send Yourself an E-mail If you're not constantly sitting in front of your Mac, e-mail alerts can be very useful, whether you check messages on your mobile phone, another portable device, or a Windows machine at work. To set up an e-mail alert in iCal, choose E-mail from the Alarm pop-up menu, select a time, and then select the e-mail address you want to use (if you have more than one for yourself in Address Book); iCal will include the event's title in the subject of the message, and the note (if there is one) in the body. It can send e-mail alerts only when your computer is awake and connected to the Internet, and it works only with Mail. If you use another program as your default e-mail client, you'll have to set up an account in Mail. In Google Calendar, choose E-mail from the Reminder pop-up menu, and the program will send a message to the address associated with your account (typically your Gmail address). Google Calendar sends messages even when you're not logged in. Send Yourself a Text Message There's no reason to miss a reminder just because you're out of the office. If you've got your mobile phone in your pocket, an SMS message can be a quick and much-needed prompt. In Google Calendar, you'll first have to tweak the settings. Click on the Settings link at the top of the page, and then select Mobile Setup. Choose your country, enter your mobile phone number and carrier, and click on Send Verification Code. An SMS message containing a six-digit number should pop up on your phone. Type that number into the Verification Code field, click on Finish Setup, and then click on Save. From now on, whenever you want Google to send an SMS alert, choose SMS from the Reminder pop-up menu. Unfortunately, iCal cannot send an SMS text message directly to a mobile phone on its own. You'll need the help of another program, such as Alco Blom and Rene Laterveer's SMS Mac ($10 per year and $0.10 per message). You'll have to download the SMS Mac Scripting program and then set an alarm that triggers an AppleScript (as described in the next section), which sends the message via the scripting application. You can find instructions for doing this on the SMS Mac Web site; you'll also have to point the AppleScript to your SMS Mac account and pin number by following these directions. Depending on your carrier, you may be able to have iCal send an e-mail message to a special address so you receive it as an SMS message. Check with your carrier for details. One cool feature of iCal is its ability to trigger certain actions when an alert goes off, from opening a file to playing your favorite tune. Open Documents You can easily set an iCal alert to open a document or program, which is useful if you're taking your laptop to a meeting and you want your Mac to automatically open the agenda, a presentation, or another associated document. Choose Open File from the Alarm pop-up menu, select Other from the second menu, and navigate to the relevant document or program. Then set when you want it to open. Once you're finished finessing your script, save it. In iCal, choose Run Script from the Alarm pop-up menu, select Other from the next pop-up menu, and navigate to your saved script. In the past few years, many online reminder services have sprung up. These services allow you to create and receive notes and alerts with nearly any Internet-enabled device, or even using a telephone call. Here are three free cool services that let you keep on top of your schedule, even when you don't have access to your main calendar program. Jott The idea behind Jott Networks' Jott is simple: Register a telephone number with the service, call in, and dictate anything you want, including e-mails to yourself, quick reminders, and to-do items. You can also add events to Jott via the Web site, e-mail, or SMS (using a special Jott address or text number). Whenever you call Jott from your registered number, the service recognizes who you are (using Caller ID) and asks you to choose a recipient (for instance, yourself, a list you've set up, a Web-based service like Twitter, a contact, or a group). Use keywords to specify what sort of information you want to "jot" down (such as a reminder or a to-do item). Once you've gotten all the specifics down, you can dictate a short message (up to 30 seconds). Jott uses a combination of computerized speech recognition and human transcription to rapidly turn spoken messages into text. You can check all of your reminders and notes at the Web site, or the service can send reminders via e-mail or SMS. It can even put items on your Google Calendar (you'll have to add Google Calendar to your Jott links first). E-mail reminders include a link to the original voice recording, which is handy if there are transcription errors. reQall Like Jott, QTech's reQall lets you phone in notes and receive reminders via e-mail or SMS. You can also send and receive alerts with an instant-messaging client such as iChat. The service turns your to-do items into an iCalendar feed, which you can subscribe to in iCal (but not Google Calendar); it also offers an RSS feed in case you want events to appear in your news aggregator. Unlike Jott, reQall does not currently provide connections to Twitter or a way to add events via e-mail or SMS, though there is an iPhone version of the program, as well as a Firefox plug-in that can grab clippings from Web pages and add them to your list of notes. Remember The Milk With Remember The Milk (in beta at press time), you can create reminders via a Web interface, e-mail, Twitter, or SMS (using your Twitter account). Though it doesn't have its own speech-recognition interface, you can configure Jott to direct spoken reminders to your Remember The Milk account. The service delivers alerts via e-mail, Twitter, instant message, SMS, or Atom news feed. To-do items also go into an iCalendar feed that you can access with iCal. A Pro account ($25 per year) includes access to a special iPhone version that lets you view and manage upcoming tasks. With iCal and Google Calendar alerts, along with online services, you can manage appointments and to-do items on almost any connected device, from your Mac to your mobile phone. So you no longer have any excuse for for missing your appointments and deadlines. Senior Contributer Joe Kissell is the senior editor of TidBits and the author of numerous e-books about OS X.